Disney Magic -- It's Why We Go to Disney! Disney Magic — It’s Why We Go to Disney! Walt Disney World features thrills, rides, shows, and something known as Disney Magic! Well, as you can see in the title, there’s one simple answer — Disney Magic. While those two words don’t necessarily mean anything to anyone who hasn’t been, or who didn’t get it, some of the stories that I’m sharing with you will hopefully give you an insight into what Disney Magic is all about. So sit back, relax, and enjoy. Let me tell you about my friend Merida. You know my daughter (name omitted by editor)…sometimes you cannot even tell she has aspergers, and then sometimes, like today, things get tricky. She gets something set in her mind and it must happen. Today, she wanted to finish coloring her picture for Merida because she LOVES her. Her turn came to meet her so soon, though, and she couldn’t finish the picture. Tears. Meltdown. And usually that means the end of the day for us. 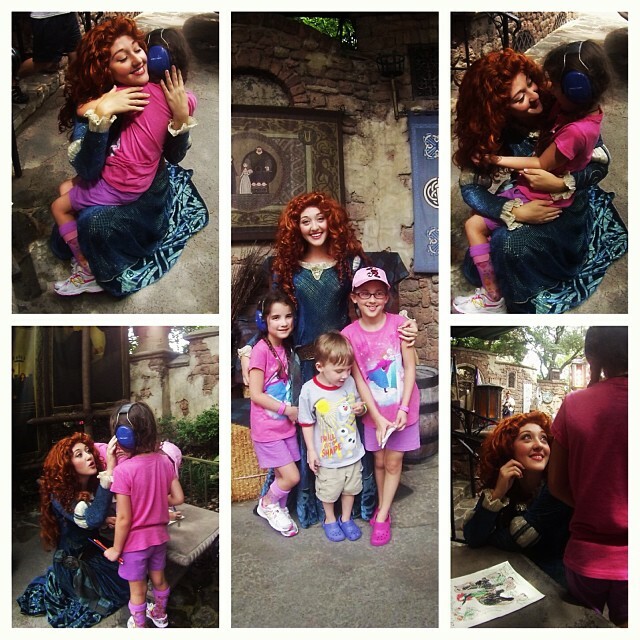 But Merida saw this and took my daughter to the side so they could finish the picture together, like friends. And she wiped her tears and pushed her wild hair off her face (Merida knows about wild hair) and listened to her. That Merida. She’s so beautiful, inside and out. What Merida did for her little daughter, in my opinion, is truly what Walt had in mind for Guests of his parks. He wanted anyone — and I mean anyone — to be able to come to Disneyland (or, in our case, Walt Disney World) and to be able to put aside, to forget, if you will, what their problems are, what their aches and pains and maladies might be, and in doing so, to remember what it is like to be a kid. Jennifer’s story touched my heart because my daughter suffers similarly to her daughter, and there are times when she has trouble like Jennifer’s daughter does. So when I read a story like her story, I shed a tear, and I give God thanks for people like Walt Disney, who opened his heart and shared his imagination, his skill, his creative genius, and his heart with all of us. 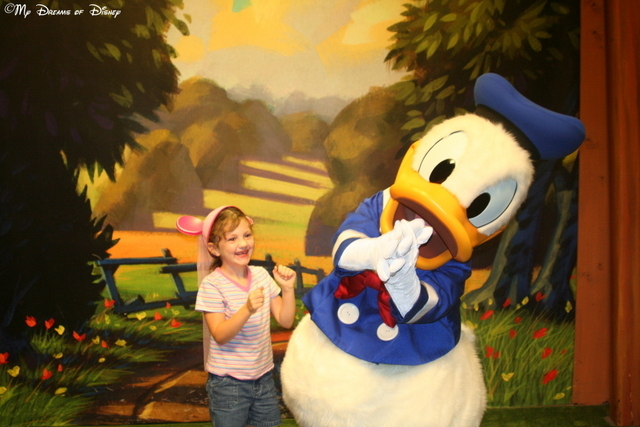 2007: Sophie (age 6) and Donald Duck dancing with excitement! The year was 2007 — it was the first trip we took where we stayed on property. Sophie was 6 years old, and was absolutely in love with Donald Duck. We must have a 100 pictures of Sophie and Donald Duck in various outfits from that trip. This particular picture was taken in Mickey’s Toontown Fair, and Sophie was so excited to see Donald Duck that she literally started bouncing with anticipation! That started Donald Duck bouncing, and the end result is a whole set of dance moves that they did together! I wish I was better at joining them all together, I’d post it for you. 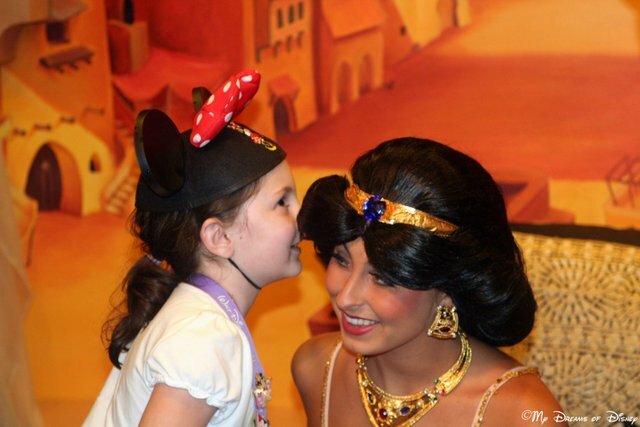 Sophie was sharing secrets with Princess Jasmine in 2008! We were at Epcot in the World Showcase. For some reason we decided to explore the Morocco Pavilion even though we almost never stop to look. We were at the back of the pavilion, and came around a corner, and there she was — Princess Jasmine and the Genie — with no one in line to see them! It was pure Disney Magic. Sophie was able to spend probably 5 or 10 minutes (it felt like an eternity to me) visiting with Princess Jasmine, and the Genie — he was doing everything in his power to get Sophie to acknowledge him, but she would have none of it. Out of that time, this picture emerged, still a favorite after all of these years. Sophie and Goofy checking out pigtails and ears! This picture, which takes us back again to 2007, was taken at Restaurantasaurus. At that time, the restaurant was a character dining restaurant, not a counter service location like it is now. 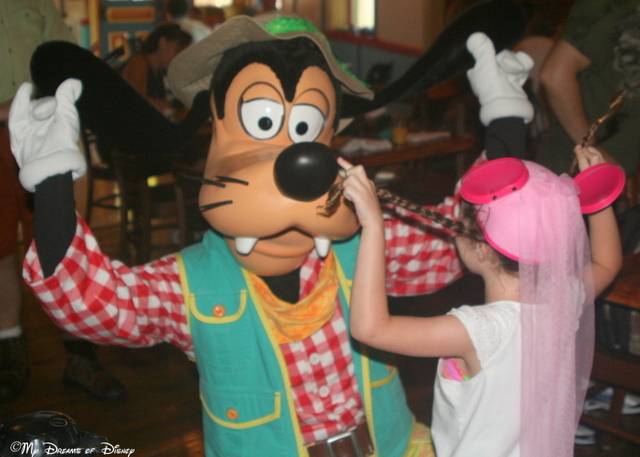 We had a reservation for breakfast, and during that time, when Goofy came to visit us, Sophie took Goofy’s cue of pulling his ears out and did the same thing with her pigtails! Shane proposes to Stephanie in front of “her” Castle. Of course, no exploration of Disney Magic would be complete without sharing once again the story of Shane and his bride Stephanie. 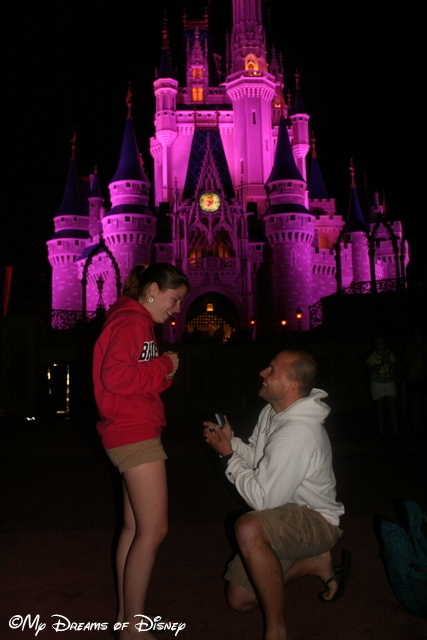 As Shane wrote in his own words, his dreams came true in 2012 in front of Cinderella Castle when he proposed to his wife Stephanie. We all were in tears, and the Disney Magic was so thick you could slice it with a knife. Walt’s dream when he created Disneyland was to be able to create a space where parents and children could go together, where they could ride the rides together, where they could be a family together, and where they could let their imaginations take them back to their childhood. The stories I’ve shared today are proof to me that his vision has been achieved, and that Disney Magic, even today, is alive and well. What stories do you have to share that prove that Disney Magic exists? Please share in the comments, and thanks!